Summer Science Experiment, Take Two | T.O.T.E. Mo, Jess and I stopped by City Farm last week and picked up a praying mantis egg. 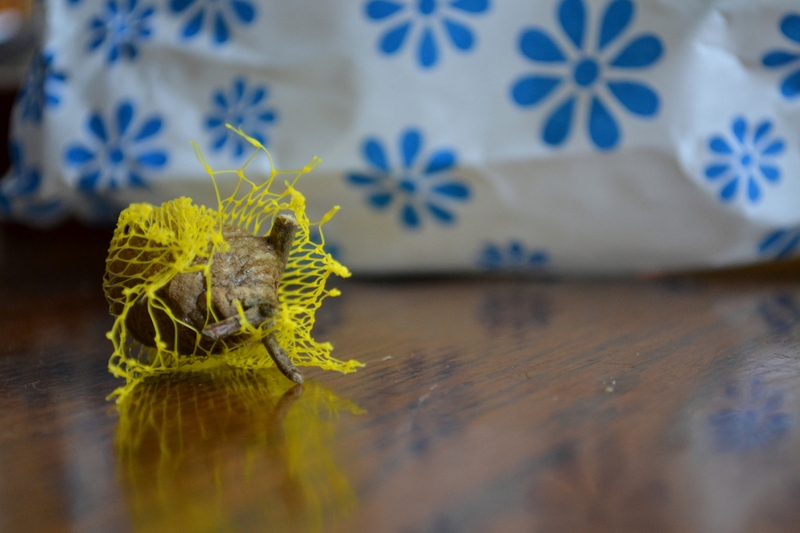 Now, this isn’t just any average cocoon. Actually, it’s not a cocoon at all. It’s an egg sac that will hatch somewhere between 100 and 200 mantises (much to my surprise, plural mantis is not manti. It’s mantises or mantids. I must have sounded pretty stupid to any entomologists I met recently…). As Nikki removed the egg sac from the refrigerator, I read the instructions. These told me that the mantids will hatch after 2-8 weeks of being in warm weather. Considering that by yesterday they had sat on my kitchen table for a week, I decided we should get them outside ASAP. As cool as I think praying mantises are, I’m trying to think of something more creepy than 200 baby mantids crawling around my kitchen. I’m pretty sure I’d have the heebie-jeebies for at least a year. Forget the heebie-jeebies, I’d have giant-mantis-neck-biting nightmares forever. Anyway, here are the steps to hatching these critters according to Nature’s Control out of Medford, OR. 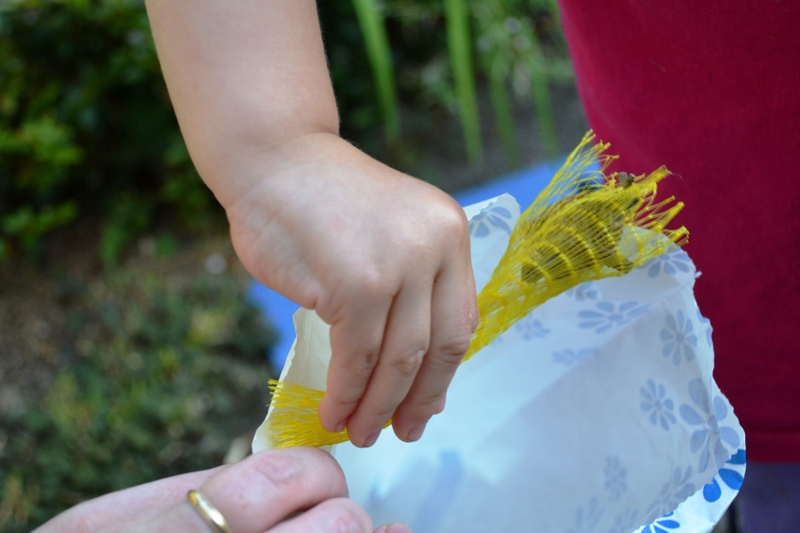 Give the egg sac to a super cute 2 year old. Tell her to be gentle and not to squish anything. Observe her giant smile and enthusiastic “Baby bees!”. Find the only paper bag you have in the house, which happens to be from your husband’s recent dental visit. Hope that flouride residue doesn’t affect the “baby bees.” Put said egg sac into the paper bag and close with a clothes pin, paper clip, stick of chewing gum…you get the picture. 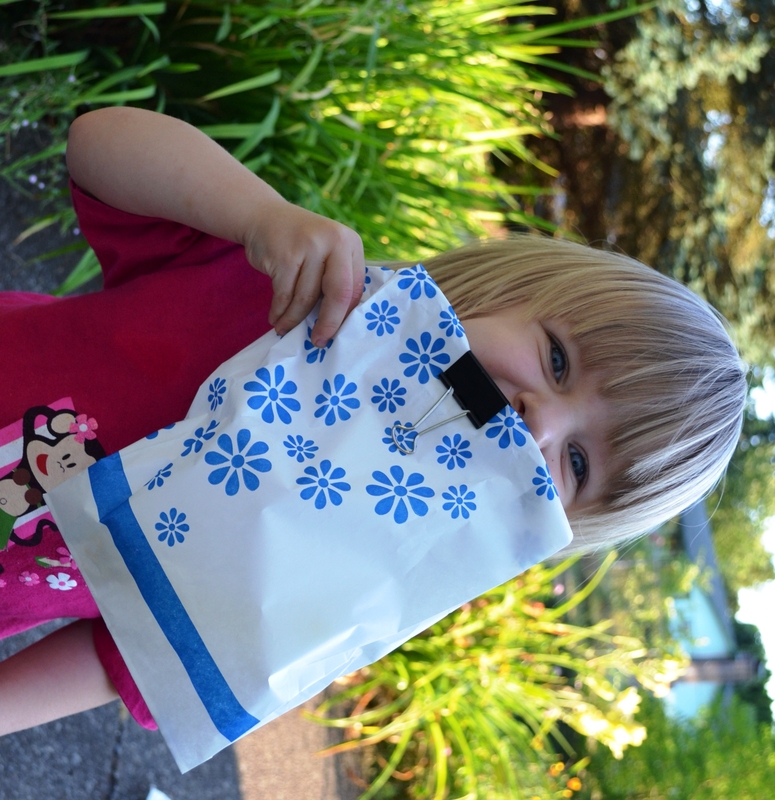 Speaking of picture, tell your 2 year old to smile and hold the bag by her face at the same time, then take a picture of the resulting cuteness. 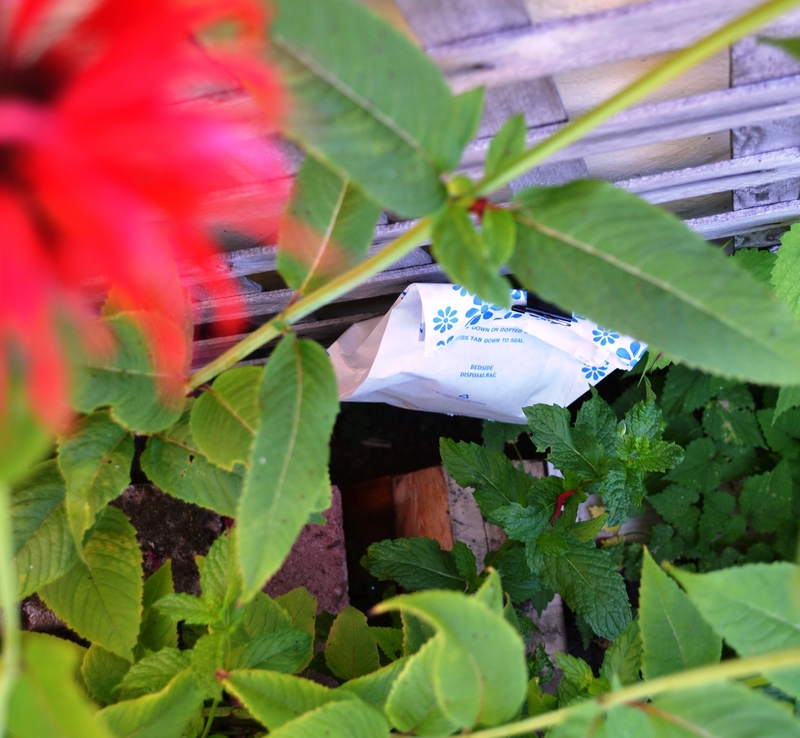 Hang the bag in a shady area, near your garden. Pray that it doesn’t get soggy in the rain or smashed by anxious 2 year old hands between now and hatching time. 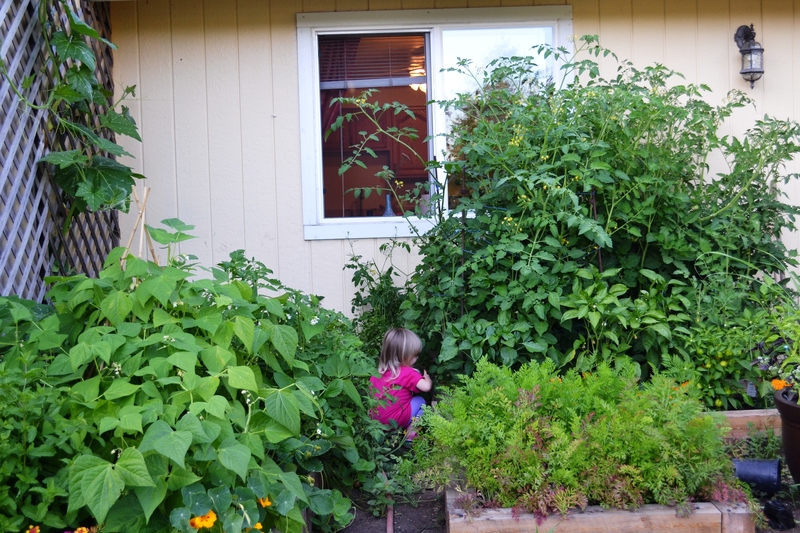 Distract your two year old by telling her there are ripe cherry tomatoes. Check in the bag every day for itty-bitty bug-eyed…well, bugs. I have more faith in this experiment than the last one. Now if these hatch while I’m not looking, I won’t be worried they’ll turn up in my sheets. This entry was posted in Uncategorized and tagged City Farm, Geekery, Mo Pic, Mo Story, New Home. Bookmark the permalink. Loved this! Once we have a garden, I’m going to get praying mantids as well. I always liked them and they were one of the few insects I felt comfortable having crawl all over me. That and – lady bugs! 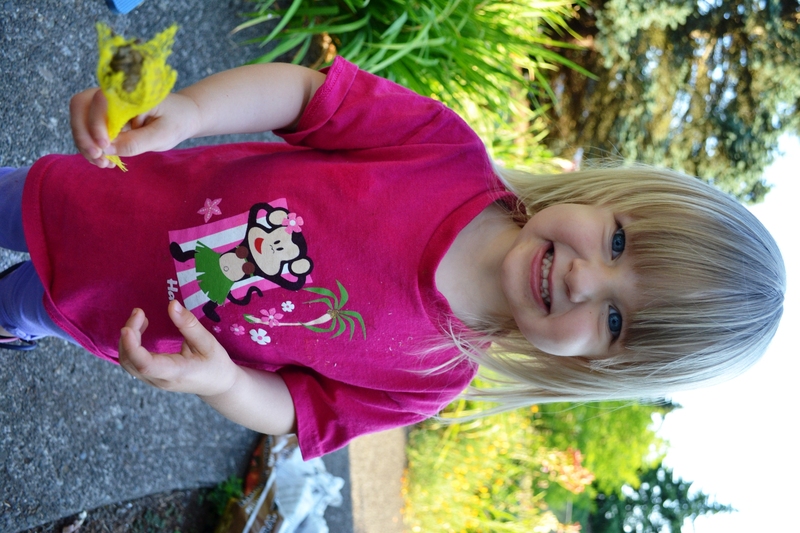 SO… every late spring, my kids had so much fun when we went to get a bag of lady bugs, decided which dusk (?) to release them and how many went back to the fridge for a later coming out party. They spent the next hour distributing throughout our gardens, then searching for them for weeks to come. I THINK you guys already did this, but it is fabulous fun. Our rose bushes appreciated it as well. I really do NOT like aphids. Kinda exciting/horrifying to watch them being gobbled by lady bugs. I love living life through the eyes of a child. Details I miss as an adult – who doesn’t spend 15 minutes hunkered down watching the feast and demise of species. Time for more pictures of Lu!!!! I love your family, Caitlin. I’m very, very grateful to be able to vicariously enjoy this season of your lives. Aw Margaret! I’m so happy you read and enjoy our blog! We haven’t done lady bugs, but we’re heading over to Nikki’s store today. So, we may just pick some up. Mo LOVES them! I’ve certainly enjoyed watching your house transformation on facebook. That renovation needs a blog of its own! Blessings! Pingback: Bleaching My Feet | T.O.T.E. Pingback: The Bug Days of Summer | T.O.T.E.